I am heart-broken to give you the news that Mason passed away late Tuesday evening. He was surrounded by his family and experienced so much love in his short life. Scott and Becky are grieving tremendously at this time, but even they continue to show what a strong family they are, even as they face the loss of their precious son. It is my prayer and plea that we give this Go Fund Me one last strong push in order to help them with the funeral expenses. As you know, adopting Mason took away the financial support the state would have given him had he stayed in foster care. The last thing they need to worry about it how to finance his funeral. I am asking that you reach out in faith and share what little or lot you have to give to help the Guccione family. Please share this with your own friends, family and co-workers and share how brave and life changing Mason's life has been to those around him. Mason...we know you are no longer in pain, and for that we are so very grateful. You have changed so many lives by your smile and optimism even in the face of all you have experienced. You have a family that loves you, and has given every piece of themselves for you. Now it's your turn to be their angel up above, guiding them to live the same type of life you lived, with bravery, smiles, kindness and love. You are so Mighty Mason. So very Mighty and so very very LOVED. Visitation is Friday night 6-8 at Barnes Funeral Home in Ozark. The funeral will follow Saturday morning at St. Elizabeth Ann Seaton church off Republic Rd. in Springfield. Time to be determined. 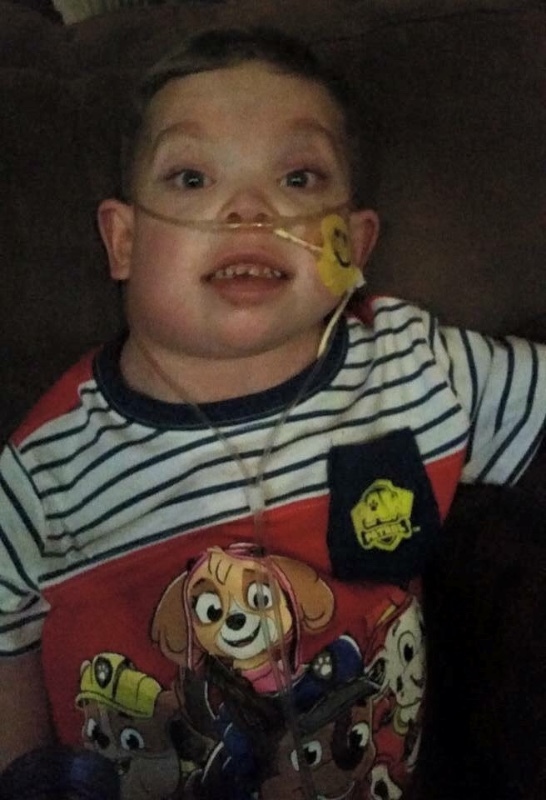 Updated in April: Below is the story of how our Mighty Mason got to where he is today, but here we must post an update so you can be aware of what his future looks like and what the needs of his family will be. 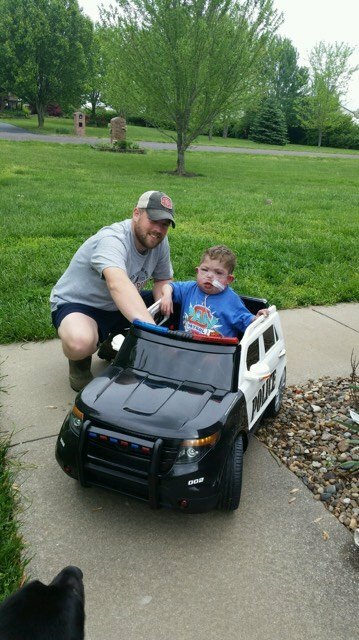 Mason recently has his 16th surgery since this began back in October. The surgeons only gave him a 50/50 chance of even surviving it. Mason did survive, but unfortunately the doctors have run out of options for making Mason better. The family was told it was time to put him on hospice. Scott and Becky have been stronger than anyone I know as they now prepare to take their little boy home for what weeks or months are left of his life. They plan to spend time with his brother and sister and spend some time outdoors after being cooped up the past 6 months. Mason does not know he is dying. He believes that his heart is fixed and he is so happy to go spend time with his sissy. There is plan in place for making Mason's last days as comfortable as possible. The family of course is devastated. And yet as sad and broken-hearted as they are, they have been smiles and positivity for their son. Here is the BEST news...MASON IS ADOPTED! They were able to petition the courts for an immediate adoption so that Mason can FOREVER be a Guccione. Please help in whatever way you can. Since they adopted him out of foster care, the system will no longer help with funeral costs. Both Scott and Becky agree it was worth that loss to have him be THEIR son. So let's help ease that burden for them, so they can spend whatever time Mason has left on this earth together. Mason was diagnosed at birth with a double outlet right ventricle. This required a series of 3 surgeries to fix. Following Mason's third surgery, he began to experience complications, the most serious and troublesome being extreme leakage of his lymphatic system. 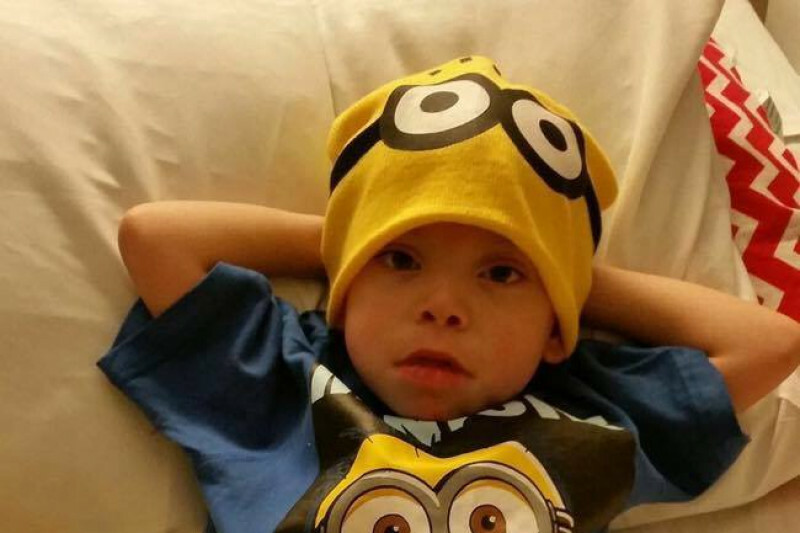 Mason has now had an additional 12 surgeries since being admitted in October. At this point, he will be needing a very major and very complicated heart surgery, or a heart transplant. Neither of which his weak body is able to handle at this time. 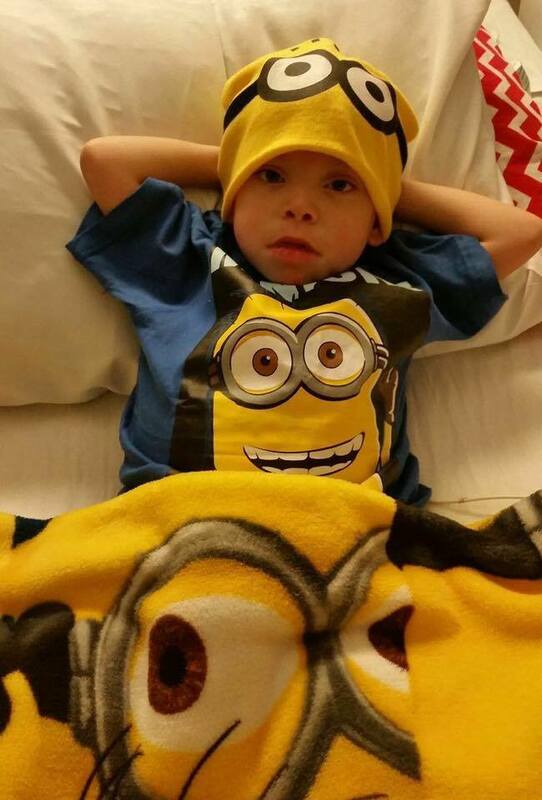 Long term it looks as if Mason will reside in Kansas City at the Children's Hospital for months to come. His foster (soon to be adoptive!) mom Becky has been with him non stop and his dad Scott has been back and forth between work and caring for their other two children Payton age 9 and Lainey age 3. Due to this latest news, Becky will be moving into the Ronald McDonald house in KC. In a few weeks Lainey will be joining her, but Payton will stay behind to attend school. Prior to this surgery, Becky was employed full time, but of course had to leave her job in order to care full time for Mason. This loss of income has been difficult for the family, but even in their time of need, they have a hard time asking for help, so we are doing so on their behalf! If you can give a little or a lot, every bit helps! 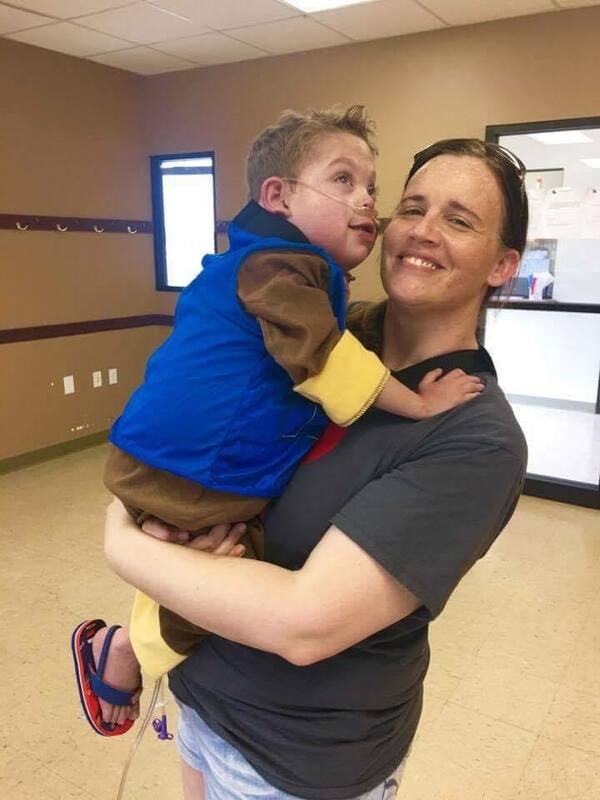 The funds will go to help replace Becky's income, be used for monthly bills, hotel expenses (Mason was in Pennsylvania for treatment recently), and anything else the Guccione family needs as they brave this path with sweet, strong, smiley and Mighty Mason! I'm sad to bring you bad news this time. Mason is now at the end of his short life. His mom Becky tells me that he is so swollen that his right eye is shut now and fluid is coming out of his ear. He is sleeping most of the time now. Becky and Scott have plans for making Mason's passing as peaceful and painless as possible. PLEASE keep them in your thoughts and prayers as they spend their final days with their son. Speaking as their friend, and on their behalf (even though they would hate that I am!) I'm asking you for any financial donation you are able to give. Scott and Becky adopted Mason a short time ago so that he could be a Guccione for life. Unfortunately that now means that Children's Division and the state won't cover any of his funeral expenses. That is the LAST thing these grieving parents need to worry about right now. They have given up EVERYTHING for this child. Their time, income, family, job security etc. all in the name of loving a foster child with extreme special needs. There is no one more deserving than this family. Reach out to anyone you know and share this story with them. Tell them how wonderful, strong, brave and happy Mighty Mason has been throughout all of this. Ask them to donate financially so that this family has one less thing to worry about in these final days. This is my greatest plea to you. We love you sweet Mason and we are so proud of your bravery. you have CHANGED LIVES with your sweet smile. First off, we just wanted to thank you for all your love and emotional, mental, physical and financial support of the Guccione family. Becky and Scott have many times expressed to me how much it means to them. Unfortunately, Mason is beginning to deteriorate faster than they expected. His body is extremely swollen to the point he can't walk and barely eat anymore. He is getting tired much quicker than he did before. 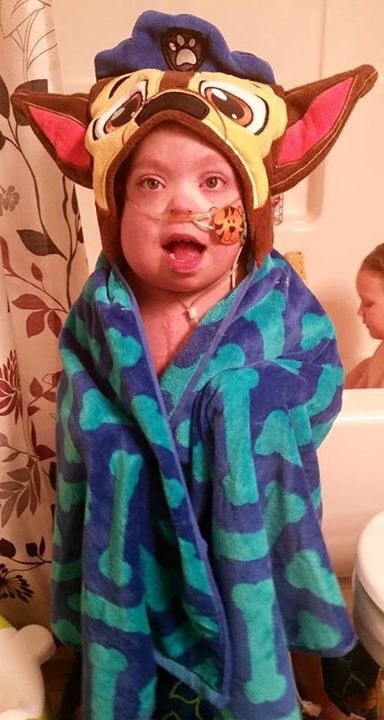 His family is trying to give him every experience he wanted, including time with his siblings, and bath tub time! He is having more bad days than good, but they are making the most of the good days. Naps with mommy has become his favorite time of the day. We continue to pray for a peaceful transition from this life to the next, for minimal pain and suffering. We pray for peace for Scott, Becky, Payton and Lainey as they prepare to experience life without their son and brother. Mostly we pray that Mason continues to be the amazing smiling little boy that has inspired so many people to love every day and find something to be happy about. He continues to show grace in his suffering, smiles through his pain, love for his family, and joy in the midst of sorrow. We love you Mighty Mason!!! Mason is now HOME! He has been having lots of visitors, although Becky and Scott do ask that you please call ahead and limit your visits to 15-20 minutes or so as Mason gets tired quickly. They were able to do family pictures yesterday, which will be a huge blessing moving forward. Mason is experiencing quite a bit more swelling in his belly. Enough that Becky and Scott had to purchase larger size shirts for him. The swelling means that the lymphatic fluid is leaking more and more. This is uncomfortable for him, and causes him some pain as well. This is going to be the hard part for the family, so please keep them in your thoughts and prayers! I'm overwelmed. This is so amazing!!!! Thank you everyone from the bottom of our hearts. 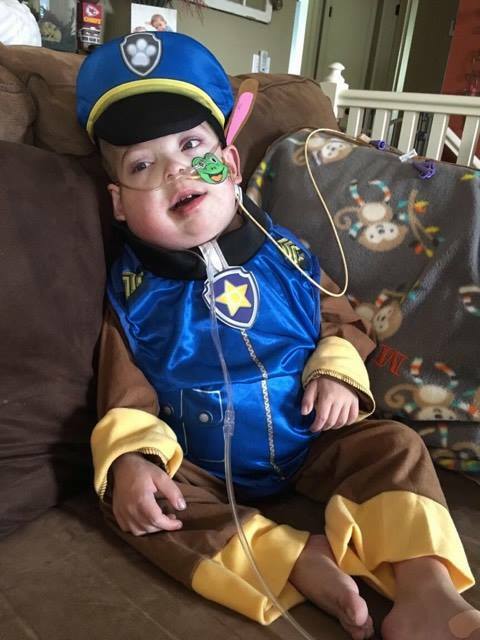 Becky, prayers to you and your family, i saw this on the news with tears down my face, he looks like one amazing kid, i would like to buy him a toy, where can i send it too? Continued prayers are with you during this difficult time. We love you.